Ex-US Vice-President Al Gore’s documentary about the climate crisis is gripping viewing, setting out in powerful graphic style, the reality and urgency of the climate crisis facing humanity. 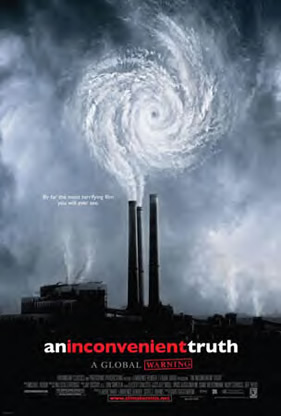 An Inconvenient truth is particularly successful in nailing the lie that there is scientific disagreement about the causes and seriousness of global warming. An analysis of almost 1,000 scientific papers on the subject over a six-month period found not a single one that denied climate change is due to increased CO2 in the atmosphere as a result of human activity. A study of popular newspaper stories in the US over the same period, on the other hand, showed over 50% continuing to claim that the scientific community is split over the issue. This is not surprising given that companies like ExxonMobil and Philip Morris have funded pseudo-scientific bodies that undermine scientific work. Only this week it emerged that the British Association for the Advancement of Science has written to Exxon’s British brand, Esso, requesting that they stop this funding. But even if there is a growing consensus around climate change and even if everybody sees Gore’s film and becomes powerfully aware of the issue, the question remains “what to do”? And this brings us to the two major problems with the film. First, it offers no serious answers to the problem whatsoever. And second, Gore’s presentation leaves out the interaction of economy with technology, society and ecology. This is because it is impossible for Gore to say the “c” word; capitalism is the elephant in his sitting room – or global lecture theatre. 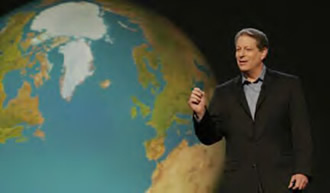 Gore says there are the three main causes of the current climate change crisis: the dramatic increase in the world’s population; the technological revolution which has increased our ability to affect the planet – making humanity, as he says “a force of nature”; “our way of thinking”. While it is true that rapid population growth has gone alongside dramatic growth in CO2 emissions, the causal relationship is not straightforward. Nor is there proof of the converse – that a reduction in population would help solve the climate problem. Looking at population growth in isolation leads to the kind of thinking that produced the inhumane and disastrous sterilisation and one-child programmes in India and China. In the past 15 years, the world’s net agricultural production increased annually by 2.2%, significantly outstripping the percentage growth in population over the same period - between 1.56% in 1990 and 1.14% in 2005. This growth has been mainly in the developing world, where agricultural output increased by almost 3.4% per year while output in the developed countries increased by just over 0.2% per year. Food exports from North America and Europe are stagnating and the poorer countries of the world are exporting more. Livestock production (37% of total production) increased by over 2% per year and cereals by just 1%. Oil-bearing crops increased by 4%, fruit and vegetables by 3.8%, eggs by 3.8%, meat 2.7%, milk 1.2%. Therefore, the main increases were in the kinds of cash crops required by the transnational food corporations, rather than in the staples needed to feed populations. In the countries where there is significant population growth, there is also significant increase in food production. The problem is the food is not for consumption by the people. In the countries where this exported food is being consumed, population growth has slowed and in some countries, populations are actually declining. In Britain, it is estimated that on average 30% of the food we buy is thrown away. Some 17m tonnes of food worth up to £20bn a year are thrown into landfill, even though approximately 25% of it could be safely eaten by people or animals, or turned into compost and energy. The cost of transporting it and throwing it into landfills is thought to be more than £175m a year. At the same time, 4 million people in the UK cannot afford a healthy diet and one in seven people over 65 are at serious risk of malnourishment. Clearly, food production and consumption, far from being the well-oiled global machine boasted of by the supermarkets, is chaotic, wasteful and unjust, wherever you are in the world. These figures suggest in crude terms, that we could see an overall reduction in world food production of, say, 0.5% annually and still be able to feed the growing population. But to do it would require nothing short of a new agrarian revolution, including redistribution of land to the poor; local production of food for local consumption; a reduction in intensive livestock farming and a reduction in food exports. And every one of these measures would contribute to a reduction in CO2 levels. It would also require taking the power to decide what happens in food production away from the transnationals. Food justice, an end to poverty AND halting those aspects of global warming attributable to agri-business, are interconnected processes that can only be achieved through a transformation of economic production and the political process. In the same way, whilst it is true that technology has transformed humanity into “a force of nature”, that is as a result of technology being put only at the service of global capitalism, and not at the service of humanity and ecology as a whole. Bush and Blair claim we can “technologise” our way of the climate crisis, leaving the solution in the hands of creative entrepreneurs. But new technologies for improving climate change will never be widely available whilst goods are produced for profit. There are examples of this already: installing solar panels in your home costs a fortune; wind farms are being located for cheapness; building continues to take place on flood plains with architects now planning houses that can rise on stilts above flood water. They might as well build them like Baba Yaga’s house in the Russian fairy story – on chicken legs so they can run off through the forest when the waters rise! The third problem Gore highlights is “our way of thinking”. For Gore, climate change is a moral and ethical question. His “mission” is to teach people about climate change “person by person, city by city, family by family”. Well, that sounds like Mission Impossible! It might get Gore an Oscar, it won’t get rid of one particle of CO2. Actually, what transforms people’s thinking is their situation in the world, rather than the cleanliness of their souls - and millions of people across the planet, more every day, know that there is a crisis in climate. Farmers are finding they must switch to different crops; electricity supplies are constantly in crisis in big cities because of demand from air conditioners; every day the papers are full of stories about the rapid melting of the polar ice caps and what that will mean. So the problem is not awareness, but power, and the absence of opportunities for people to influence what happens in society through democratic processes that serve the needs of the majority. Gore glosses over his and Bill Clinton’s own pathetic record on ecology when in power and has very little to say about the failures of the present White House. He does urge people to use the existing political process – the same political process that enabled George W. Bush to steal the White House from Gore himself. During the credits, there is a final desperate message: “If you believe in prayer, pray that people will find the strength to change.” And that’s the problem with this fascinating and quite seductive film. Unless we discuss, organise and finally change the capitalist status quo, we have no way of preventing the destruction of many countries and many millions of human beings – and maybe life itself on the planet. It is a question of leadership, and if humanity is left with leaders with no political answers but “moral force”, we will be left singing “we shall overcome” as the waters rise over our heads. "So the problem is not awareness, but power,"
I don't agree with this fully. I would contend that 95% of the UK population are only vaguely aware, with perhaps 2 thirds of those hardly aware. If I was aware that there was an escaped tiger in my back garden I would be locking the doors and getting on the phone immediately. If I learned that a tiger had escaped somewhere in North West London I'd have a good look before I went in my back garden. If the tiger was somewhere in SE England, I'd look for something else to read in my newspaper. People need to be made aware that things are going to get progressively nasty for them and their children before they'll get excited. So the name of the game is not to tell them that millions of Bangladeshi’s will be devastated over the coming decades, but to point out how their lives are going to be changed for the worse, partly because the system that is piling goodies on their plate is going to be coughing and spluttering more and more as the environment and ecology fight back. Then people will start to take things into their own hands. This doesn't mean vigilante gangs going around beating up politicians; people with the wit to realise that they have to individually and collectively take things into their own hands will have the wit to know there's no point in beating up politicians. Although when the new dawn does break, T. Blair and others may well be drawn to account.